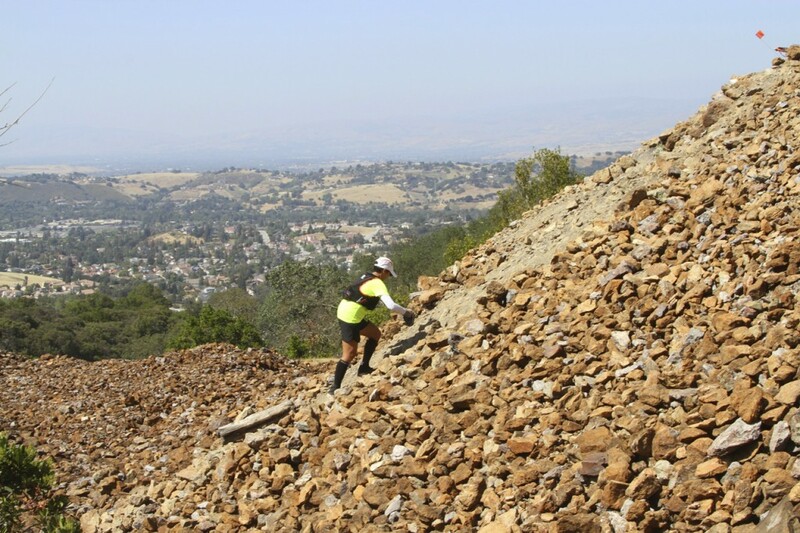 Obtaining a Boston Marathon qualifying time at the Napa Valley Marathon in early March had been my sole focus since Javelina and my training reflected that. 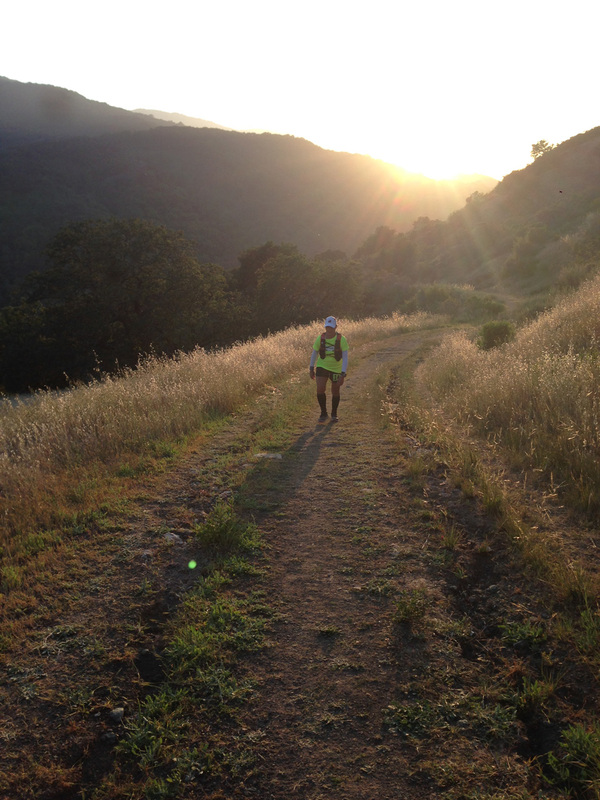 There wasn’t much time to switch gears and prepare for a 100k with 13,000 feet of elevation gain. It requires a different set of skills and strengths, ones that don’t come easily to me. I tried but I felt off kilter. I attributed it to the normal ups and downs one experiences during training and continued to charge ahead. 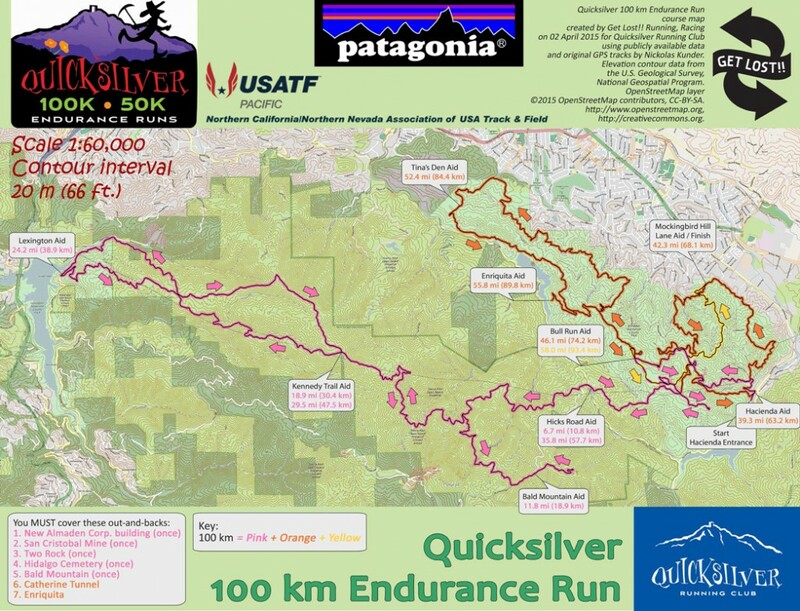 In early April I had paced my sister, Pauline, to her first 50 mile finish at the American River 50 and then flew out to Utah with Alina, for her first 100 mile finish at Zion. Both were extremely rewarding experiences that I wouldn’t trade for anything but strangely instead of feeling inspired by their achievements I felt mortified. I’d seen what they’d put themselves through to get to the end and I couldn’t fathom why anyone would voluntarily undergo such hardship. It was as if I was on the outside looking into a world I no longer understood and had no place in. This is a disconcerting thing to feel as an ultra runner because implicit in that meant I no longer understood myself. The red flags were being raised but I was ignoring them. This eventually culminated three weeks before Quicksilver in a week that found me lying on the floor drenched in a cold sweat wanting to throw up after a track workout that felt much harder than it should and I couldn’t complete; an easy recovery run the next day that was downright awful; and a weekend where I tried to make up for my perceived lack of training by doing 35 miles on Saturday and 25 miles on Sunday – both lackluster and joyless experiences. Was I training or doing penance? I couldn’t tell anymore. I was in a hole and if I went into Quicksilver like this I had a horrifyingly miserable day ahead of me that I didn’t have the wherewithal to manage. I did the only thing I knew to do – I stopped running. Breaks usually come after a race not before but I had to piece my head back together and I had three weeks to do it. The first week I didn’t run at all. Instead I went to Texas to cover the Brazos Bend 50 for USL.TV. I got little sleep, dealt with connectivity issues, pummeled by wicked thunderstorms, and experienced animal encounters of the mosquito and alligator kind. It was exhausting and awesome. The second week I ran only if I wanted to. If I felt any resistance I didn’t push. 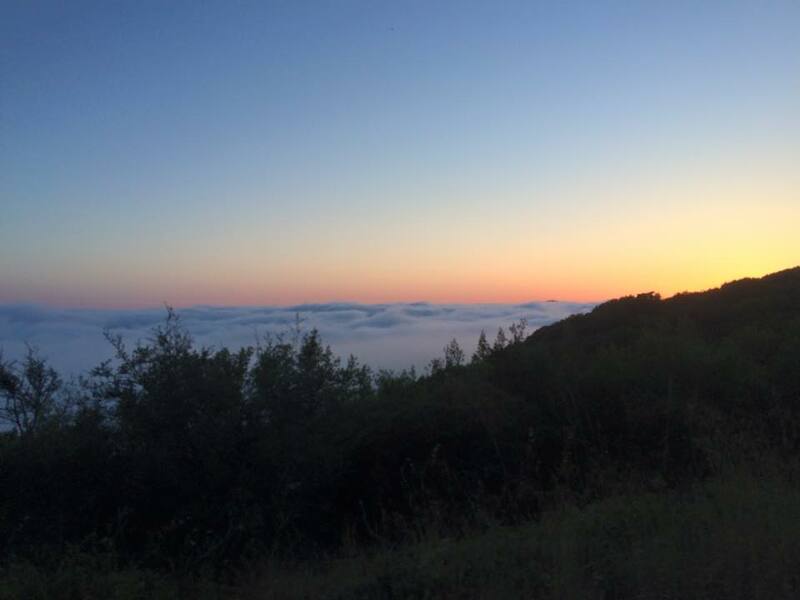 I wanted to use my limited mental reserves for the race, not expend it on a training run. When I did run it felt good again. The third week was race week. Running was minimal, short and very easy. I was actually starting to look forward to race day and getting excited. Standing on a start line with questionable fitness and a mind held together with duct tape is hardly ideal. While I had stepped back from the ledge I had no idea how this would play out. The first 40 miles went surprisingly well. On the brutal 5+ mile climb from Lexington (mile 24) up Priest Rock Trail to the lovingly nicknamed “Dog Meat” section then up the “Kennedy rollers” to Kennedy 2 (mile 29.5) I put my head down and worked. The first half is the hardest part of the course and it was behind me now. I was on pace for a 15:30 finish which would have given me a Western States qualifying time. Considering how awful my last long trail runs went I was happy to say the least. The “Dog Meat” section of Priest Rock Trail. Some of the toughest climbing I’ve ever done. 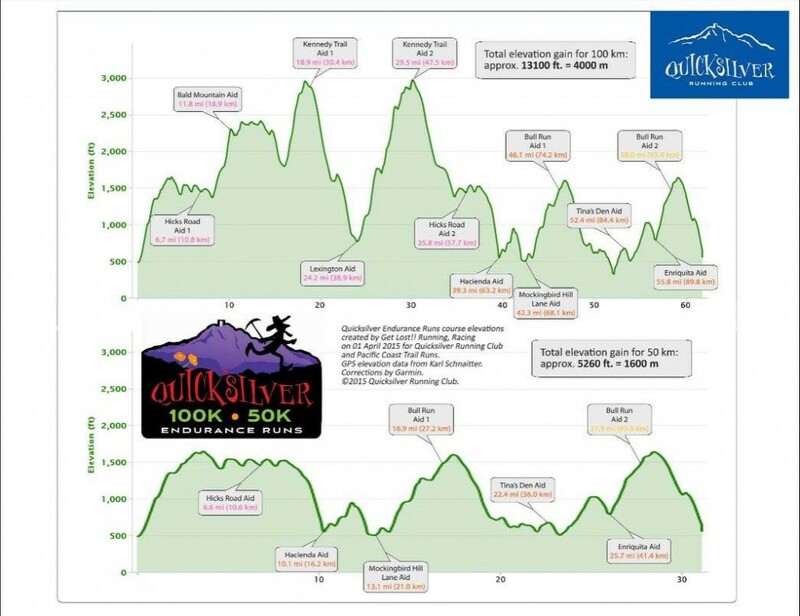 There is nothing in my race history that suggests I have a 12:30 50-mile or a 15:30 100k finish time in me on a course with a lot of vertical gain. I knew going in that pushing this sort pace was playing with fire but I did it anyway. I wouldn’t know where my line was until I crossed it and that happened somewhere been Hacienda (mile 39) and Mockingbird (42). I deteriorated badly. I could hardly run. Even the flats and downs that were so easy just 30 minutes before were impossible. If this happened to me in a 50 mile I’d do a gut check and carry on. There’s 10 miles left and the proximity to single digits means the end is near. But it’s a 100k with 22 miles to go and I might as well be traveling to Mars. I immediately ate what food I could but it made no difference. I was so discouraged when I got into Mockingbird that I buried my face in a towel and cried. 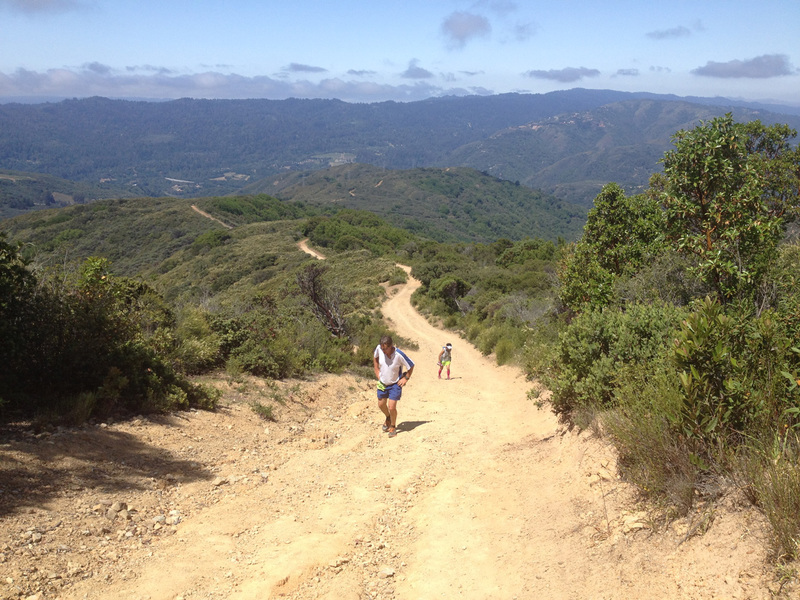 This race was heading down what was becoming a well-worn path to “100ks gone wrong”. It didn’t occur to me to quit. I don’t know why. I’ve had lesser upsets make me go in that direction. No, I just stood there and let the Pamakids who’d finished their 50k take care of me. Emily with cups of Coke while Janeth and Alvin doused me with water and ice. All with encouraging words and finally a push out the door. My rough patch continued to get rougher as I made my way to Bull Run 1 (mile 46). 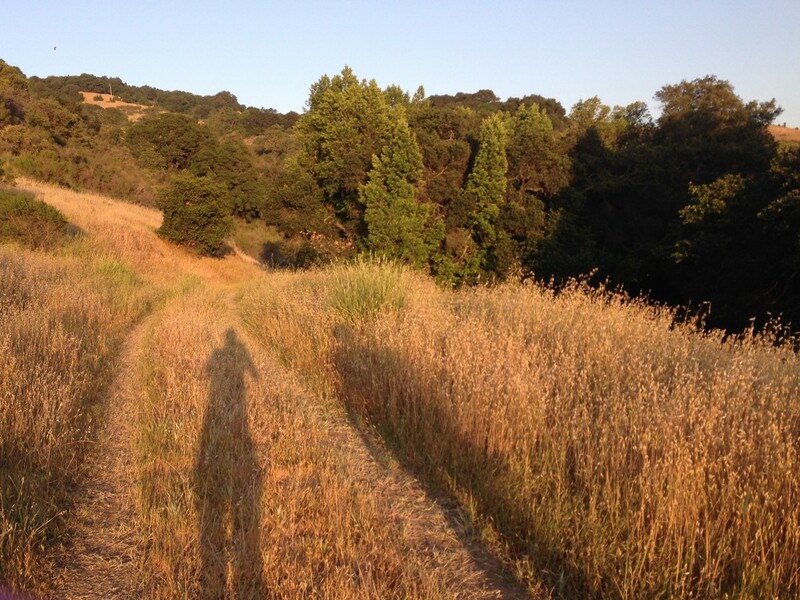 I was starting to cramp up – my foot, my quad, my calf. It was a random traveling cramp that spared no muscle group. I was also dealing with signals going to my brain that my bladder was full, painfully so, only it wasn’t at all. Imagine trying to run with this sensation and there is nothing you can do to make it go away. Good times. I hit the bottom when the course took us to the Buena Vista mine shaft and I saw what I had to traverse – a steep, giant pile of rocks. Every step I was taking was causing something to cramp up. It was slow, painful going. This was Tartarus on Earth and I was Sisyphus minus the boulder. The good thing about finally landing in the basement is that things can only get better. I solved the phantom bladder pains when I stopped drinking. It occurred to me that my intake rate was surpassing my stomach’s processing ability. That the weight of a fluid-filled stomach pressing down on my bladder was causing the pain. Did I pull this out of thin air and make it up? Without a doubt. I have no idea if there is any truth to it. All I know is it worked. And the cramping, while it never went away entirely, didn’t progress into a full-blown lock up but eventually the seizing occurred less and less. I could start running again. 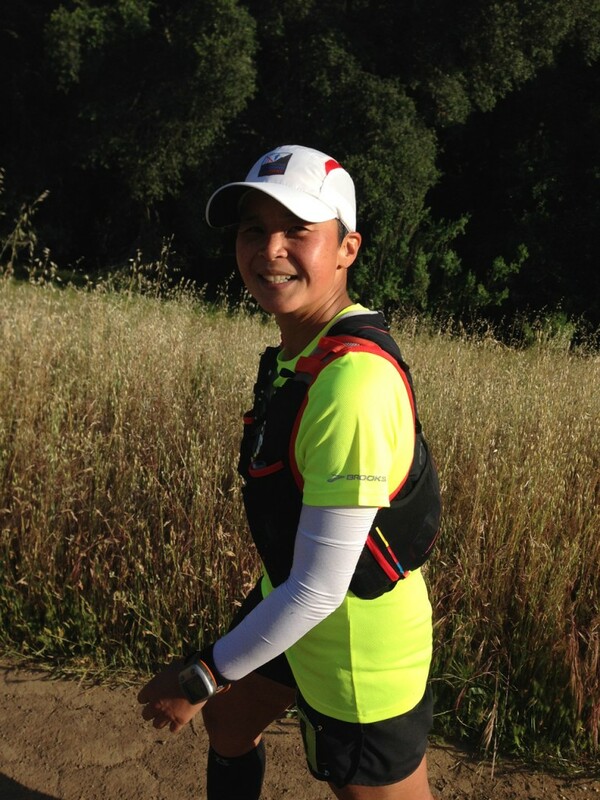 I was now making my way to Tina’s Den (mile 53) where I would pick up my pacer, Jen. I could not wait to see her. About a mile before I reached it I saw a familiar person coming towards me. It was Jerry, our ultra team captain, and he joined me for the short uphill push to the aid station. It was really nice to talk to somebody and he was so encouraging. He let me know Jen was there and excited to see me. The lift I got when I saw her was profound. I soaked in her high energy as she buzzed around me in typical Jen fashion. I’d asked her to bring a can of Coke because aid stations often run out of it. Noé let her hide it in a cooler and fended off other runners who saw it and wanted it. She and Noé even got me to eat half an avocado right out of the shell. Normally this is something I would find revolting (and still do) but I needed the calories and it was easy to eat. At that moment it was the best thing ever. 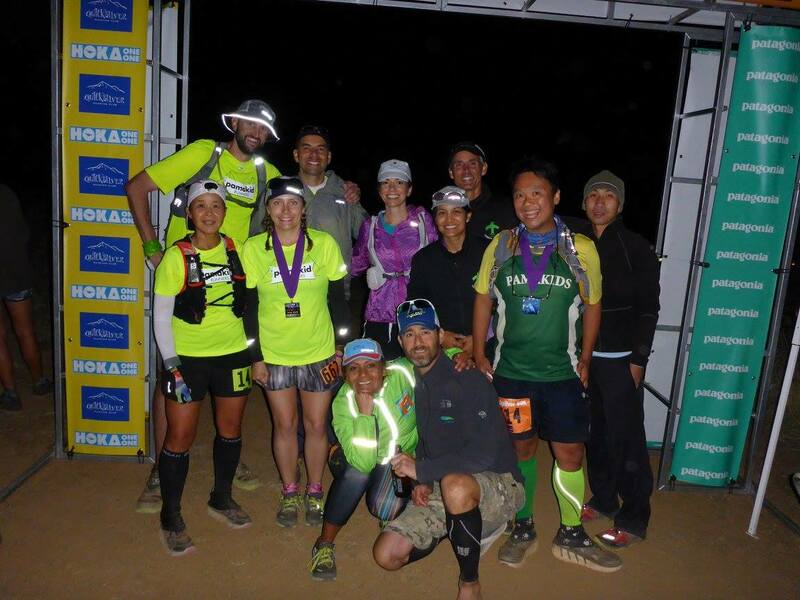 We made our way to Enriquita (mile 56) taking pictures, telling stories and laughing all with her gentle reminders to “just keep shuffling” while we waited for the food to kick in and the ibuprofen to take the edge off the ache that had settled into my legs. I couldn’t seem to stop telling her how much it meant to me that she was there, how grateful I was, how awesome she is. I was turning into a sloppy sentimentalist but I was with someone who I felt completely free and easy with, who I absolutely trusted. I knew then that everything would be okay. We got to Bull Run 2 (mile 58) and there was nothing but downhill and a few rollers between us and the finish line. It would be dark soon and the temperature was dropping. We were making our way down at a steady clip following a stream of yellow glow sticks. About 1.5 miles away from the finish line my headlamp died. I normally have spare batteries and a handheld flashlight on me but I forgot them back at Tina’s Den. Jen took her headlamp and put it on my head. “Remember that steep descent at Bryce we had to make in the dark with the one headlamp?” I asked. It was her headlamp that day too. We were in the rollers with sharp little ups and downs. My wobbly legs slowed us a bit but we were so close now. Suddenly we heard voices cheering. It had been silent up to that point save for crickets and frogs but now there were people somewhere below us. I started laughing. “Remember how I was hearing voices and kept asking you if it was Proctor Canyon?” It’s clear Bryce is still alive and well kicking around in my brain pan. We turned a corner and there it was. Bright lights, people, and a finish line to cross. Was it a mirage conjured by my tired brain, like the voices in the night at Bryce? “Can you see? It’s right up there.” Jen pointed to the finish line. “Come with me,” I told her. I knew her preference was to hang back, have it be my moment but it was hers as much as mine. It wasn’t just about this race. I saw my team, ready to greet me with open arms. Loren, the aid station captain at Kennedy, who had shown me such enthusiasm and encouragement was there too. My day that derailed and slowly got back on track came to a close. I crossed the line in 16:26 and bettered my finish at Bryce by over 14 hours. There were extenuating circumstances to that story, of course. With something that outlandish there usually is. I sat in Jen’s car while she gathered my drop bags and got me some food. Do I regret that I blew up spectacularly after 40 miles? No. I knew what I was doing was risky and I paid the price. I haven’t run with that sort of reckless abandon in a very long time. I’m usually so measured. But I learned a lot. I learned that I could adjust and salvage the day as long as I didn’t give up. I also learned that if the clock had stopped at 50 miles I would have had a 12:52 time. I’ve never gone sub-13 on a course with so much ascent and descent. If I could have maintained what I was doing through mile 40 I would have clocked a 12:06 50 mile time. That shocks me. I glimpsed possibilities that didn’t exist before. What I do with that is an open question. Jen came back with food and as I tried to eat my breathing turned rapid and shallow. I could hear her asking me questions but I don’t think I was responding very coherently. “I’m going to get the medic, ” she said and left. What was wrong with me? The EMT arrived and started asking me questions. I answered as best I could. I’ve been nauseous post-race before but this was something entirely different. Then I started shivering. Up until that moment I didn’t feel cold but now I was freezing. Jen quickly zipped me up into a hoodie and somehow produced a sleeping bag. A sleeping bag? It’s like she had the magic trunk to cure what ails you. The moment she covered me head to toe my breathing went back to normal and the shivering became less violent. She started the car and turn up the heat. I was okay. I just needed to get warm. I’ve been wondering why I felt compelled to write about this part of the day. It wasn’t important nor life threatening. At the time I attributed it to my body adjusting to what I had just put it through. But I realize something similar had happened at Bryce. I was lying in a sleeping bag trying to rest at Proctor Canyon but I couldn’t relax enough to sleep because I was cold and shivering. Then Jen had people bring me closer to the fire and placed another sleeping bag on top of me. And, again, I was okay. It was like a parting shot from Bryce – don’t forget me. Bryce was a singular experience and will always have a hold on me but maybe, just maybe, I found a little bit of closure at Quicksilver. Wow. You never fail to impress me! How in the world you kept on going with so much going wrong, I (and all normal people) will never understand. That’s nothing short of super-human. And I really like how Jen is your conduit to your super-humanness. (I know, that’s not a word. Probably.) Thanks for writing this all up and sharing it. We’ll make it a word! Jen says we make a good team and she’s right. I’ll be sure to let her know what you said. She’ll love it! 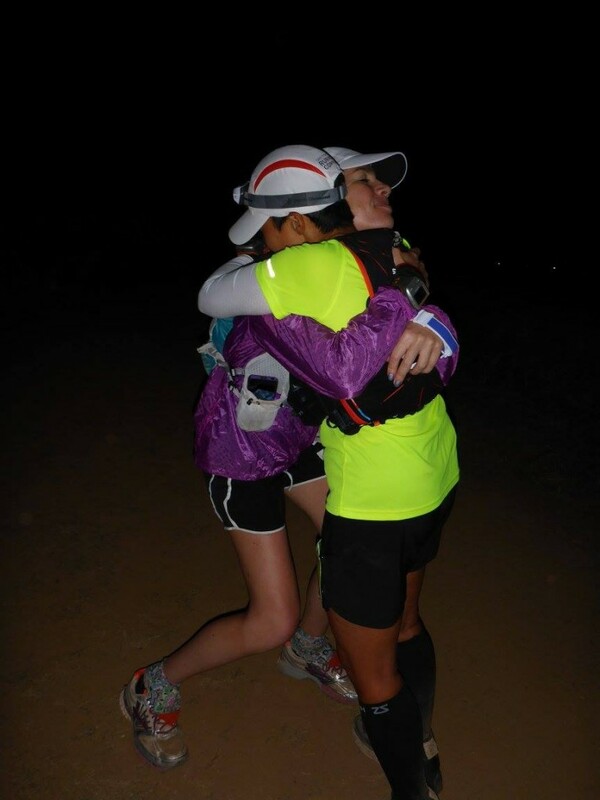 I finally put together my QS100K race report last night, and just came across yours. Congrats on gutting it out, and great write up. Thanks, Sean, read yours too. It’s so true, things are good until they are not.